Research Interests: Parental care, parasites. Honours Project: "The effect of parental crea on the susceptibility of juvenile Acanthochromis polyacanthus (spiny chromis) to parasites". Most coral reef fish have a pelagic larval period as part of their lifecyle. 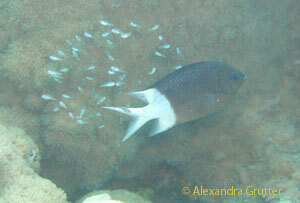 The benefit of this is unclear but it has been suggested to be to allow the young fish to avoid reef-based parasites. Rose's project tested how one reef fish species that has no pelagic period potentially deals with reef-based parasites. The aims were to determine if the parasite composition and load of juvenile A.polyacanthus changed ontogenetically; and to investigate whether juvenile A.polyacanthus were more susceptible to parasites than juvenile fish that have a pelagic larval period and no parental care. Penfold, R. Grutter, A.S, Kuris, A.M., McCormick, M.I., Jones, C. (in press) Interactions between Acanthachromis polyacanthus and gnathiid isopods: Predation or Parasitism? Marine Ecology Progress Series.